It isn’t often you come across anything “Madras” anymore. Located in one corner of Bazullah road, in T Nagar – this sure grabbed the attention of passers by. Passing through it day in & day out, never managed to stop by until one of those weekend work at office with no regular coffee supply, pulled me to get the taste of coffee at this place! Being a coffee lover and an ardent coffee drinker (not just Kaapi) thought to myself – this place better be good to impress me! 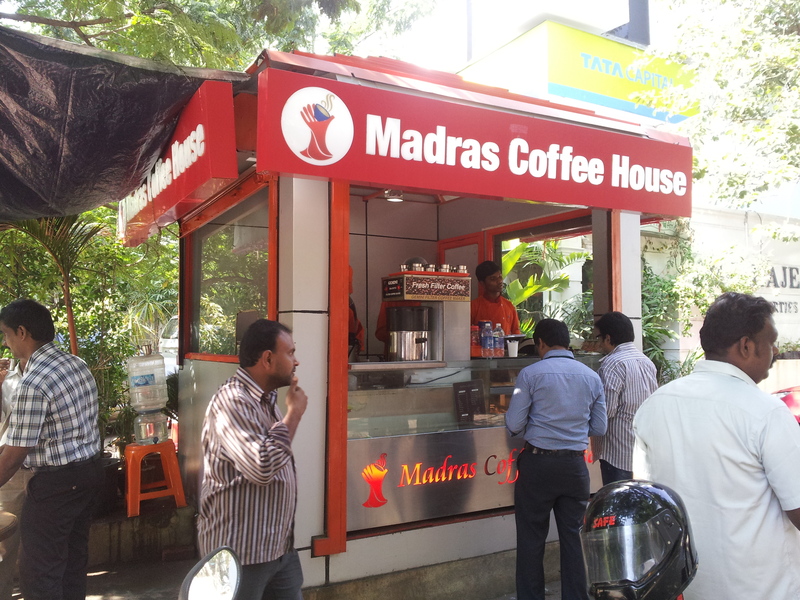 Coffee can be had in typical Madras Fantasy – Dabara Tumbler or in Paper Cups. And this is no “Instant” or “Machine” Coffee being served. It is pure Filter coffee! Note: Paper cups aren’t too thick like CCD or Barista ones and with Coffee being too hot, watch out when you hold it! As an add-on you can buy Small samosas or cookies. Place also serves tea and other items like Sandwiches – do check out their menu, if you want to grab a bite but no seating place! With no other quick eatery or coffee place in the near by, this place attracts many from air-conditioned corporate workers to representatives on bikes to passers by! After tasting coffee in places like GSS, HSB, which is more costly, this place does win over.